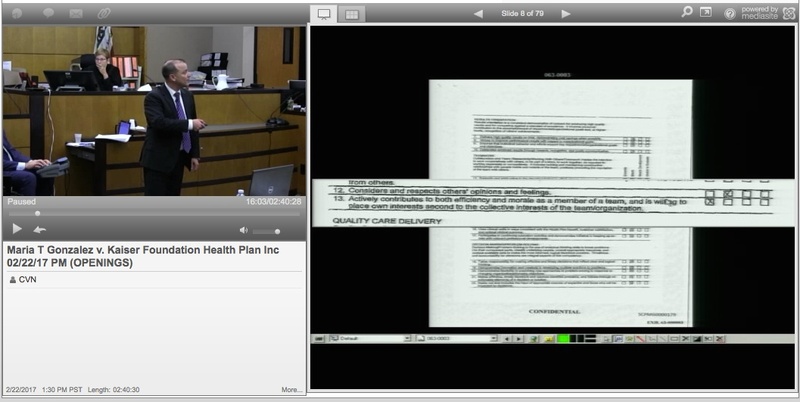 Courtroom View Network screenshot of Attorney David DeRubertis showing jurors a copy of his client's last performance review during his opening statement on Wednesday. Click here to see video from the trial. Gonzalez claims she received a sterling performance evaluation prior to her son’s illness, but Kaiser maintains she was fired for accessing Pedro’s medical records without proper authorization despite his being a patient in the pain management clinic where Gonzalez worked. The trial is being webcast live and recorded gavel-to-gavel by Courtroom View Network. Gonzalez’s attorney, David DeRubertis of The DeRubertis Law Firm, told jurors during his opening statement that his client had worked at Kaiser for nine years when in 2011, Pedro began suffering from extreme pain initially attributed to kidney stones but later diagnosed as being caused by a rare condition called loin pain hematuria syndrome. The disease can require a major operation where a kidney is removed and repositioned in the body, and after undergoing the procedure once Pedro began suffering new pain that DeRubertis told jurors necessitated a second surgery. “Pedro became Kaiser’s worst nightmare, because he became a very expensive patient,” DeRubertis said. Kaiser supposedly resisted approving a second operation and also denied requests to refer Pedro to an outside pain specialist. Instead he received pain management services at his mother’s clinic, where Kaiser accuses her of improperly accessing his medical records due to lack of satisfaction with his quality of care. DeRubertis argued that such access took place within the scope of Gonzalez’s regular work responsibilities. When Pedro raised concerns about his treatment with a Kaiser physician, DeRubertis claims he was told, “You wouldn’t want anything to happen to your mother, would you?” Kaiser’s attorney later refuted such a statement was ever made. Gonzalez’s economic losses could approach $783,000, but DeRubertis explained that potential pain and suffering damages could be “far, far greater” since the loss of her job caused Gonzalez to become so severely depressed that she qualified for disability benefits. Kaiser could potentially face punitive damages, and DeRubertis told jurors he hopes they “send a message with punishing damages that you don’t treat employees this way,” a closing remark that drew a swift objection from Kaiser’s attorney, David Ammons of LTL Attorneys. Ammons told jurors during his opening statement that Kaiser fired Gonzalez for repeated violations of one of the company’s strictest and most serious privacy policies. Gonzalez allegedly denied that she accessed her son’s records when confronted by superiors, and she later supposedly became verbally aggressive and combative with her colleagues. Ammons also noted that Pedro continues to receive healthcare services from Kaiser today. Ammons stressed that despite Pedro receiving care in the clinic where Gonzalez worked, she had no authorization to access his medical records outside of her official duties. “Kaiser employees have no special rights to access their loved one’s medical information,” Ammons said. Kaiser employees like Gonzalez receive extensive training in order to comply with so-called “HIPAA” patient privacy guidelines, and that training specifically referenced access to records of family members. “The rules apply across the board, and Mrs. Gonzales knew this,” Ammon said. Pedro gave his mother healthcare power of attorney in 2012, which DeRubertis said provided her with additional authority to view her son’s records, but Ammons told jurors that there is still a set procedure even for authorized family members to access medical records that Gonzalez failed to follow. “Ms. Gonzales violated one of the most fundamental rules at Kaiser, and because of that her employment was terminated,” he said. Gonzales is also represented by Alreen Haeggquist and Aaron Olsen of Zeldes Haeggquist & Eck LLP. The trial before Judge Katherine Bacal could take up to three weeks to complete, and CVN will be webcasting the proceedings in full. The case is Maria T. Gonzalez v. Kaiser Foundation Health Plan Inc., case number 37-2015-00019384-CU-WT-CTL, in San Diego County Superior Court.